Have you ever felt alone in your struggles as a parent? Raising children is confusing, challenging, yet ultimately rewarding work. Your unique personality type has an influence in the struggles you face and the challenges you specifically have to overcome. 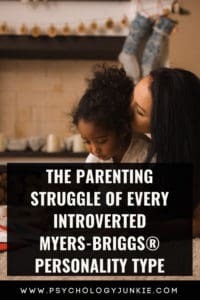 Take a look at the unique frustrations that every introverted personality type deals with in the world of parenting. INFP parents are usually understanding, imaginative, and empathetic. They believe that each child is a one-of-a-kind creation and should have their own unique gifts and abilities fostered. They don’t like to “mold” their children or force them into a prescribed role. Instead, they nurture individuality, create happy memories, and tune into their children’s feelings to try to understand where they are coming from in each unique situation. The struggles that INFPs deal with have to do with judgment or expectations from the outside world. If they are married to an individual who has different values or they have in-laws or friends who expect a lifestyle that doesn’t feel natural to them they tend to get overwhelmed. Different expectations for discipline, household organization, or any other number of things can feel aggravating to INFPs. They don’t want to have to choose between pleasing a spouse/family member/society and staying true to what they value as an individual. When it comes to parenting they take their role very seriously. They often feel that society’s priorities are out-of-balance. For example, an INFP might value quiet, one-on-one time with their child over cleaning the house every single day. Their priority for quality time might cause conflict with a family member who prioritizes cleanliness or order. Find someone you can trust to “vent” to as needed. Life as a parent can be tiring and confusing at many times. Find an understanding, trustworthy individual that you can air your grievances to without worrying about judgment. Sometimes just explaining your position and expressing your emotions is enough to help you feel better. Make time for yourself. Don’t feel guilty if you have to ask for help or turn on some cartoons so you can recharge! One INFP suggested taking time to journal and really tune into your own inner feelings, priorities, and values. Making time for yourself is vital for your well-being and this time alone will help you to discern the best method for handling a perplexing situation. INTPs are often playful, open-minded, and intellectually curious parents. They enjoy listening to their children’s ideas, posing unique questions, and helping them learn in an open-ended flexible way. They are good at fostering independence, autonomy, and a love of learning and they enjoy providing freedom and a sense of exploration in the home. The struggles that INTP parents deal with often have to do with interruptions, chaos, and noise. They like having their own space and counting on quiet time every day. Children by nature are often noisy and this can feel jarring when they are lost in thought. Having to answer a lot of questions that may feel trivial can become irritating after a long time. Having to be constantly tending to demands that pull them outside of their thoughts can get stressful. INTPs crave independence and solitude and can eventually wear down if they don’t get enough time alone to recharge. Get regular alone time if at all possible. Don’t feel bad asking family or friends for help with caregiving. If you don’t have a ready-made support network then use a web site like care.com to hire a babysitter (and get a background check!). Foster daily quiet time in your home. Give children audiobooks to listen to and crayons and paper to keep them occupied so you can take a breather. Don’t beat yourself up if you have to rely on screen-time for small bits of time throughout the day. You can find more ideas for quiet time here. Get up early in the morning to enjoy some quiet time before everyone is awake. You’ll be glad you did! INFJ parents are sensitive, nurturing, and empathetic. They tend to have an idealistic vision of how they want their family to grow and develop. They want each child to feel nurtured as the unique individual they are, and they crave harmony and imagination. These parents are good at cultivating one-on-one time with each child, listening to them and appreciating their one-of-a-kind nature. They are usually emotionally supportive and creative. Parents of this personality type tend to struggle with burnout and perfectionism. They hold themselves to extremely high standards and will work endlessly to bring their idealized family life into fruition. When conflict inevitably erupts they can feel overwhelmed and torn. Enforcing discipline can be difficult for these types because they see so many perspectives to an issue. It can be difficult for them to “break” harmony, even when they know discipline is needed. Dealing with their own failures (because, let’s face it, no parent is perfect) can also be especially tough on INFJs. They tend to beat themselves up over their mistakes and push themselves too hard. They can become so wrapped up in parenting that they feel they’ve lost part of themselves in the process. Remember that taking time for yourself is important. Even extroverted children need to have time alone to be healthy and well-developed. Schedule regular alone time throughout the day so that you can have some time to breathe, recharge, and pursue your own interests. You can find some ideas to keep kids busy here. Remind yourself that nobody is perfect. Find a friend you can trust to express your concerns and struggles with. Speaking to other parents will remind you that you’re not alone and will introduce you to some alternative strategies and solutions in your parenting life. It can be easy to forget friendships as a parent because children are so all-consuming. Don’t let this part of your life disappear. Journal your thoughts and feelings at night before bed. Getting your highs and lows out on paper can help you notice positive or negative patterns in your parenting. It can also help you to get a sense of relief from all the stress that has built up during the day. INTJs are the quintessential “teaching” parents. They love nothing more than imparting knowledge to their children. They don’t mind when their children debate, ask irreverent questions, or challenge the status quo. They enjoy a certain amount of non-conformity, but they also are skilled at teaching respect and self-sufficiency. INTJs are very committed to their children and they are good at creating a structure and routine where everyone knows what is expected of them. They are also good at providing insight and helping children see the long-term implications of their decisions. INTJ parents tend to struggle with balance. They are often perfectionistic and determined, pushing themselves too hard to do everything “right”. They tend to want to pursue outside interests outside of parenting as well, which can mean they feel torn between the two responsibilities. INTJ stay-at-home parents, in particular, tend to feel frustrated if they don’t have a vision or project outside of their home life. Try to have a project or activity that is all your own outside of parenting and housework. As an INTJ you are very independent and ambitious. Spending some time each day on your own unique goals and interests is healthy for you. Schedule regular quiet time throughout your week. If you have family, friends, or caregivers available, don’t feel bad asking for help so that you can recharge and be your best self. Don’t feel guilty for needing alone time. If you are an INTJ mother and you feel that most of the other moms you meet are different than you, they probably are! The U.S. has a predominantly Sensing-Feeling female population and so those preferences are often seen as the “norm” for mothers. Remember that your differences are valuable to your child. Don’t feel like you just because you are different you are inadequate. ISFPs have many unique gifts as parents. They are both pragmatic and gentle; providing real-world experiences and hands-on support while teaching by example. ISFP parents believe in fostering their children’s authenticity. They don’t believe in conformity and don’t mind non-conformist children who are driven to pursue their own path in life. They encourage independence while cultivating one-on-one communication. These parents enjoy all the details that make parenting special – singing lullabies, making crafts, enjoying nature. They help children to truly experience the beauty in each moment. ISFP parents tend to struggle with the routine and demanding nature of parenthood. They like to be flexible and adapt to the needs and opportunities of the moment. Having to keep up with parent-teacher conferences, appointments, homework, laundry, and dishes can feel overwhelming. The outside world can feel so intrusive and ISFPs can find the whole adjustment to parenting invasive and stifling. All parents need consistent alone time, and this is especially true for ISFPs. You need to be free to pursue your own interests and projects without feeling constantly pulled in a hundred different directions. Enlist help from a spouse, friend, or family member if you can. If you don’t have support available at the moment then find quiet activities your kids can do independently. This can be as simple as giving them a bucket of Legos and an audiobook in their bedroom or as complex as creating a quiet reading nook in the living room where they can escape into their favorite literary world. Remember what your true values and priorities are. The outside world will always be pushing in on you trying to tell you what kind of parent you need to be. Remember that one of your greatest strengths is your individuality. Take time to assess your priorities and what’s important to you for your family. Don’t worry about parenting trends, or what all the “other” moms are doing. Do what you do best and bring your individual strengths to the table. Autonomous, intellectual, and independent, ISTP parents are skilled at helping their children think for themselves. They believe in self-sufficiency and practicality and so they will provide their children with the lessons they feel are needed for survival and happiness. They respect their children’s unique differences and don’t want to be too domineering or authoritarian. It’s more exciting for ISTPs to see their children figure out their own path in life then to feel that they are managing every step for them. They strive to give their children a realistic view of how life works and how to accomplish the goals they want to achieve. ISTP parents tend to struggle with the day-to-day demands of parenting. They like a lot of independence and can feel trapped with not only the emotional demands but the homework, the chores, and the outside obligations involved with parenting. Having to be “on” whenever they are home, to answer questions, deal with tantrums and the constant noise of parenting can be overwhelming. Dealing with intense, emotional moments from children. Having to enforce structure and routine. Loss of alone time or independence. As a parent, you need to make sure that you’re getting adequate time for yourself and your own projects. Whether that means asking for help from friends or family or hiring a caregiver, some time alone to pursue your hobbies and goals is important. ISTP moms often feel misunderstood because they aren’t the “stereotypical” mom’s in the sense that they are usually more reserved, autonomous, and direct than most. If you’re one of these moms then don’t beat yourself up over your differences. You have a lot of gifts to bring to your children – your loyalty, adaptability, and skill at teaching and encouraging independence is extremely valuable. ISFJ parents are known for their generosity, empathy, and attention to detail. They are down to earth and enjoy creating a safe, secure routine for their children. They strive to provide a balance of direction while letting their children figure out their own interests and strengths. They are usually very conscientious and focused. ISFJs tend to struggle with stress over the unexpected changes and outside demands of parenting. They tend to be security conscious and routine-oriented and the chaos and unpredictability of parenting can seem overwhelming. They often feel like they are being pulled in a hundred different directions, especially if they have multiple children. As parents who appreciate one-on-one time it can be frustrating if they have to divide their attention between their job, children, spouse, and other people in their lives. They are especially prone to burnout as they tend to take on more than they can handle. Stress over conflict and giving out discipline. Uncertainty when they and their partner disagree about values or how they should raise their children. Pressure to take on more than they can handle. Ask friends, caregivers, and family members for help so that you can get a break from “mom/dad-duty” at least once a week. Teach your children the joy in independent play by setting them up with play-dough, legos, books, and activities that they can immerse themselves in without your help. Don’t feel guilty when you need quiet time and you need your kids to play alone for bits of time. Practice saying “No” to outside requests as you sense yourself becoming stressed. It’s hard to feel like you’re not helping people who need it, but you are also a person with needs and your health is paramount to your family’s well-being. Highly responsible and methodical, the ISTJ parent enjoys creating a secure routine for their family. They believe in the importance of dependability and structure and they do whatever they can to give their children the comfort of knowing what to expect from day-to-day. These parents are good at preserving traditions, listening, and teaching their children the practical skills needed to succeed in life. They are often planful, prepared, and skilled at teaching independence and responsibility. ISTJ parents tend to struggle with being perfectionistic and hard on themselves. They like having everything organized just right and tend to feel like if they have the perfect routine, the perfect to-do list, and the perfect daily schedule that somehow everything will get done. Unfortunately, parenting is anything but predictable and children have a way of upsetting daily routines and schedules at the drop of a hat. ISTJs can feel frustrated with their inability to have a certain level of control and can berate themselves for not keeping up with all the tasks they wish they could do perfectly. Loss of independence or alone time. Struggles with noise and interruptions. Exhaustion from too many responsibilities. Remember that some children will feel trapped by a very rigid structure. Having clear boundaries, rules, and a routine is important for children. But remember that if you have perceiving children, they will likely push back against these things. Don’t take it personally and try to “schedule” flexible time throughout the week so that they don’t get too frustrated. Make time for yourself! You tend to want to work before play, but with parenting there is ALWAYS more work. You need to make sure that you are resting and getting time to pursue your own hobbies and interests. Don’t feel guilty if you need to hire a caregiver, or ask a spouse, friend, or family member for some help so you can recharge. Without any independent time you will eventually burn out, and that’s not good for you or anyone else! Do whatever you can to minimize distractions so that you can feel more relaxed. Leave the phone in your room if you have to watch the kids, push your child in a stroller so that you can have some peace and quiet to think, turn off the music in your house if it’s destroying your clarity. Did you enjoy this article? Do you have any tips you’d like to share with other introverted parents? Let us know in the comments! Want to parent to your strengths and understand the personality type of your child? Get our parenting by personality course here! This seems very heavily geared toward women rather than both men and women.